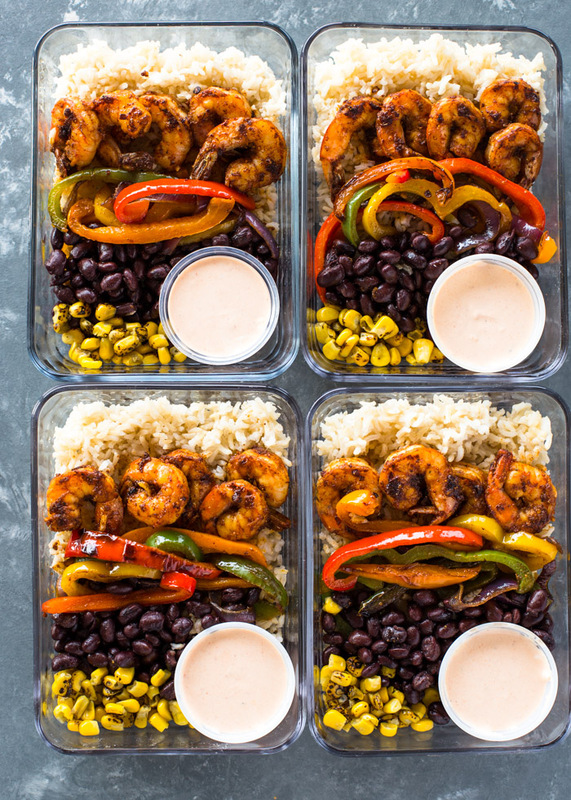 Quick 30-minute meal-prep burrito bowls loaded with spicy shrimp, fajita veggies, black beans, brown rice, and a spicy 2 ingredient cream sauce. 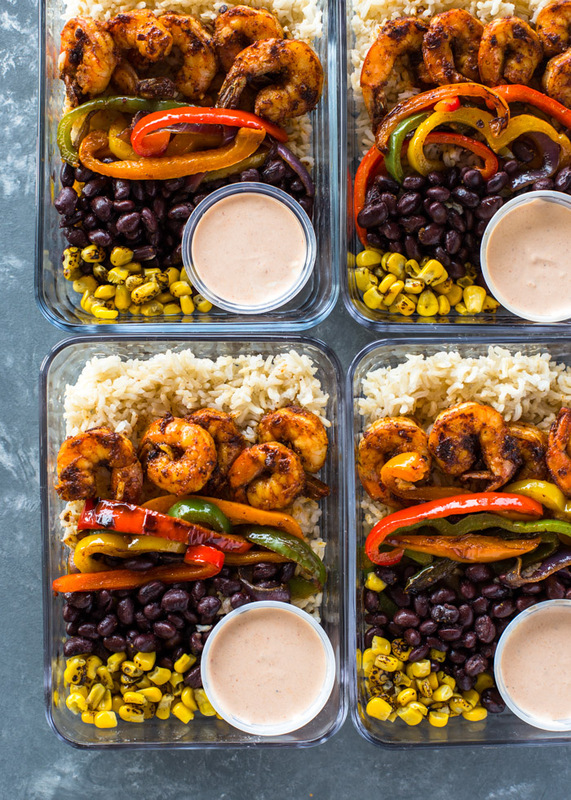 Meal-prep just got a whole lot tastier with these shrimp burrito bowls. 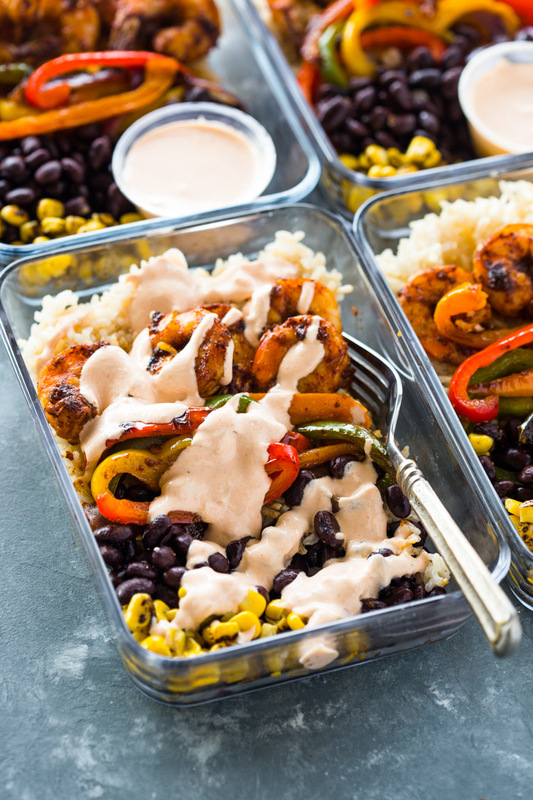 They’re loaded with spicy shrimp, charred fajita veggies, beans, corn, brown rice and topped with a tasty creamy sauce. The entire dish comes together very quickly and can be all done in under 30 minutes. I first cook the bell peppers in a tablespoon of olive oil until they are soft and tender, then remove them and add the shrimp and cook for just 2 minutes or until done! The shrimp is seasoned with chili powder, cumin, garlic powder, salt, and pepper. If you don’t have all the spices on hand, taco seasoning works great too! For the corn, canned, cooked, or frozen works great. I like to use the frozen roasted corn from Trader Joes! It’s sweet and charred and makes a great addition to any salad or Mexican dish. For the brown rice, I use quick cook brown rice. The kind that cooks in 15 minutes. Traditional brown rice, quinoa, or your favorite type of rice will also work. The sauce is simply a mixture of salsa and sour cream or yogurt. For some weird reason, these two ingredients make a delicious sauce that is great on burritos, tacos or as a dipping sauce. My creamy chipotle sauce or healthy cilantro avocado sauce are also great options. I like to keep the sauce on the side so I don’t microwave it when heating the dish. These small plastic containers are great for prepping the sauces. They’re cheap and disposable! You can order these small 2 oz containers on Amazon or check at your local target near the plastic spoons and plates. 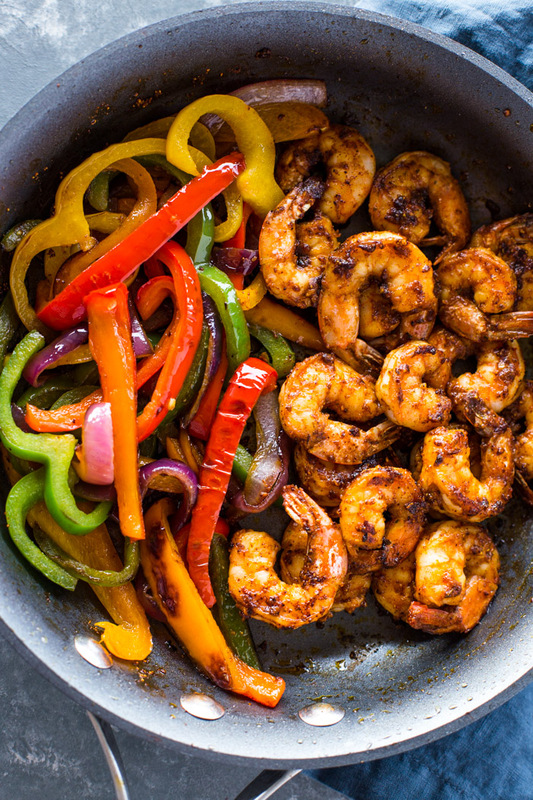 To Cook Fajita Veggies and Shrimp: Combine the shrimp, garlic, and spices. In a large skillet over medium-high heat, add 1 tablespoon of olive oil. Add the shrimp and cook for 2-3 minutes or until tender. Remove the shrimp from the pan and add the sliced bell peppers (add more oil if needed) and cook for 2-3 minutes or until tender. To assemble: Divide brown rice into 4 meal prep containers (1/2 cup each). 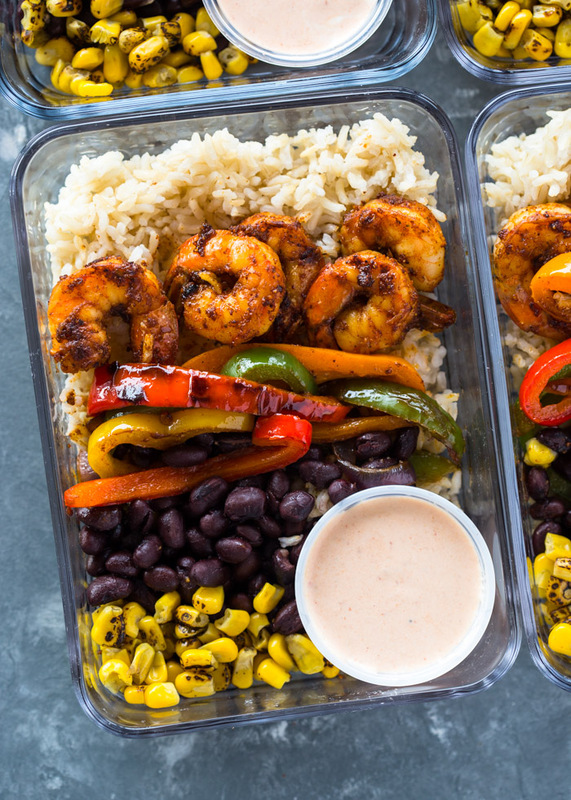 Top each container with 1/4 of the shrimp, 1/4 of the bell peppers, a scoop of black beans, and a scope of corn. In a small bowl whisk the yogurt and salsa and divide into 4 small 2 oz sauce containers or pour into 4 small snack size ziplock bags. To serve: Heat bowls (do not heat sauce) in the microwave for 2 minutes or until thoroughly. Drizzle with cold sauce. Enjoy! * Substitute the spices with your favorite taco seasoning. Hi! Thank you so much for sharing this recipe 🙂 I have a question. 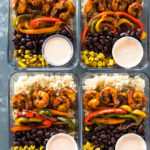 Since this recipe contains shrimp, how is the shrimp still good throughout the week? For example, if I make it all on a Sunday, won’t the shrimp already be by Wednesday/Thursday? We suggest making enough for 4 days. The shrimp should be good for up to 4 days in the fridge!